With the desire to take wellness to a higher level, Western Mindanao State University headed by the College of Home Economics launched the start of the Nutrition Month Celebration. 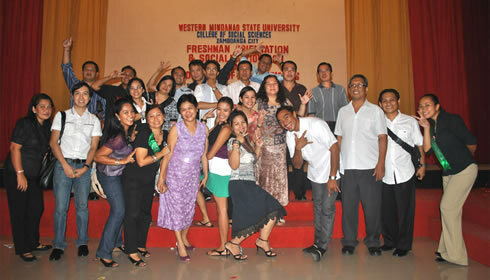 WMSU officials, faculty and staff were one during the opening program held at the university’s Dr. Juanito Bruno Gymnasium last July 4. This year’s theme emphasizes again the importance of breastfeeding –Isulong ang Breastfeeding: Tama, Sapat at Eklusibo. The event transpired right after the University Flag Raising Ceremony. On the other hand, Department of Health (DOH) -Region IX Nutritionist and Dietitian, Evelyn M. Capistrano enlightened the WMSU audience about the Nutrition Month’s theme. Capistrano shared an in-depth talk on the vitality of the nutrition community’s advocacy program on breastfeeding. During the talk, breastfeeding was endorsed as one of the most cost-effective interventions to promote child health. It also stimulates infants’ immune systems and protects them from gastrointestinal conditions and acute respiratory infections – two of the major causes of infant mortality in the developing world. It also improves infants’ responses to vaccination. Capistrano also mentioned that breastfeeding helps reduce the risk of postpartum hemorrhage among women. The university being in support of the objective of the nutrition community joins the National Nutrition Council (NNC) and the Department of Education (DepEd) in the celebration of this year’s Nutrition Month.&nbps;The latter agencies encourage the undertaking of significant activities that will emphasize exclusive breastfeeding for infants and its benefits which is manifested by good health and nutrition when the child reaches school age until adulthood. Also, WMSU President-Dr. Grace J. Rebollos headed the ribbon cutting, joined by Vice President for Research, Extension and Development-Dr. Milabel E. Ho and was assisted by College of Home Economics’ (CHE) Dean-Lucia M. Santos. Dr. Rebollos, formally declared thereafter the opening of the Nutrition Month Celebration. In line with the celebration, CHE Prof. Teresita M. Antonio presented the “Esfacially For You” Wellness Center during the program. The latter is the program coordinator of WMSU’s newest innovative training and wellness facility. Originally a project of the CHE’s Entrepreneurial class, the wellness center serves as a venue wherein CHE students apply their acquired skills in traditional Chinese medicine. Tiens-Tianshi Phils., a group which ventures in health products and health and wellness services provided the training for the students in acupuncture, massage and other basic skills. The wellness center offers a variety of health-related services such as Acupoint Facelift, Aura-Detoxification, Body Acupuncture, Hypertension/Blood Pressure control, Foot Massage and T’ai Chi Program. The wellness center is open to all interested individuals who wish to avail its services. Membership and promo discounts on each service are also offered at a reasonable fee. Esfacially For You Wellness Center is located at the second floor of the College of Home Economics building of the university. bal medicine, acupuncture, massage therapy, and even dietary therapy. These are common part of medical practices throughout East Asia, but are considered alternative medicine in the Western practice of medicine.